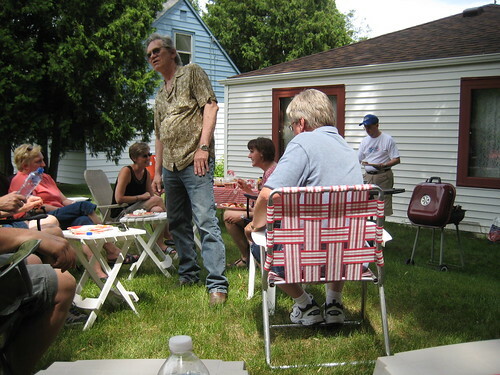 A cookout and happy 4th! 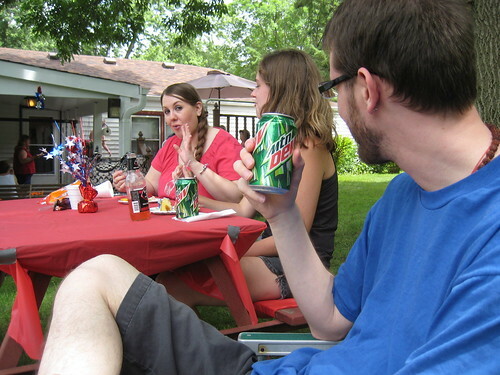 Yesterday afternoon, we went to Craig’s Aunt’s house for a cookout. I should have brought a veggie burger along because I didn’t get much protein from my meal. 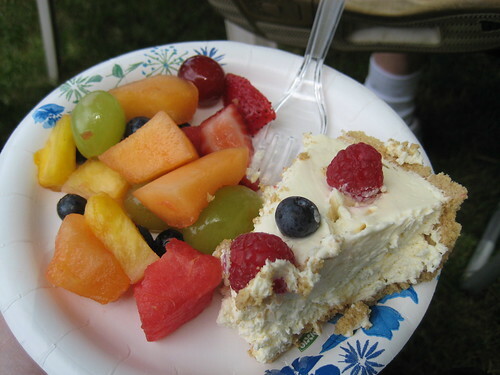 I had corn on the cob, sauerkraut, tomatoes, onions, potato salad, cherries, and then this yummy dessert plate. I love the no bake dessert with berries that Craig’s Aunt Susie makes every year. I remembered it from last year. Am I a foodie or what? 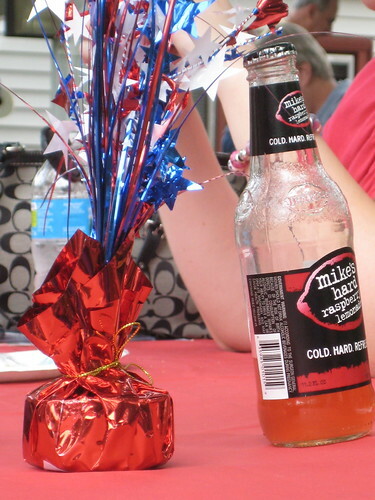 I also enjoyed a Mike’s Fruit Punch Hard Lemonade (wish I had this raspberry one pictured instead though). I felt pretty full from the cookout, so I napped for a bit when we got home and then I burned some cookout calories at the gym. It was nearly empty again, which was fantastic! 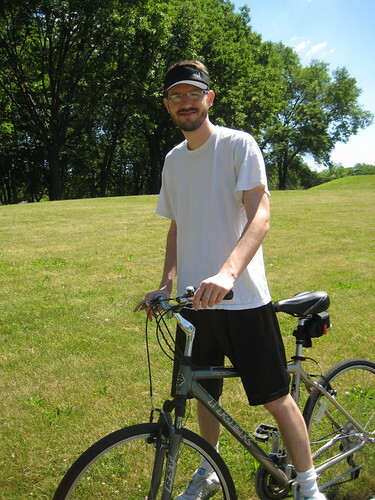 I biked while reading a magazine, lifted a full circuit of weights, and I lifted some free weights. We slept in this 4th of July and I decided not to go to the outlets with my mom. I have to buy an expensive new Mac laptop soon, so clothes shopping shouldn’t really be my priority right now. 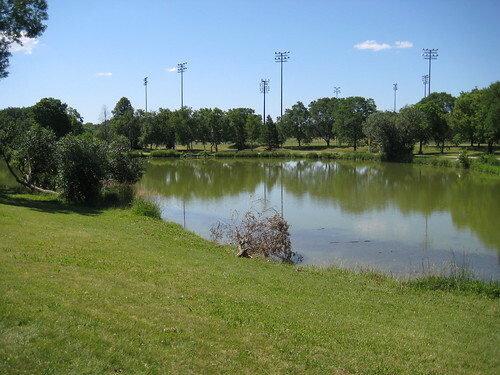 We started our morning out with a bike ride to a local park. No scary nature stories today, phew! This duck was more innocent than the mean goose from Saturday. After cleaning, doing laundry and dishes, I felt like making something. 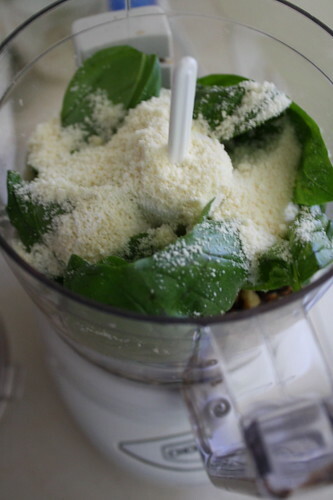 I put together some pesto because our basil plant is growing really quickly now and I need to use basil up! 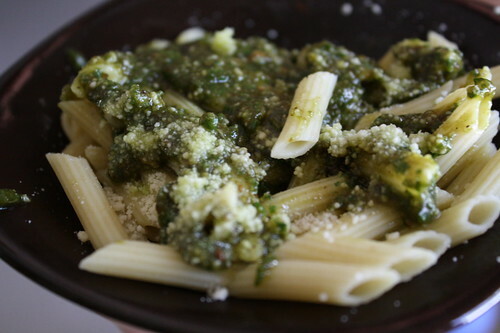 I used Mark Bittman’s Basic Pesto recipe from How to Cook Everything. Craig had it for lunch and it turned out ok. 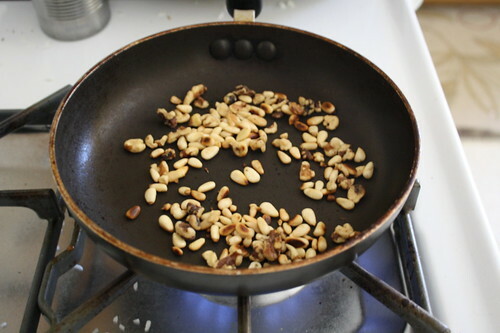 I think I toasted the nuts a little too long. I’m saving some for a dinner this week. 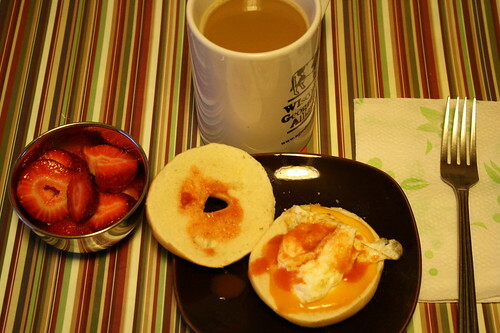 I was not hungry today and I forced myself to eat lunch around 2 p.m. I think I am having some digestion issues from not taking one of my meds. I need to go buy it this week! 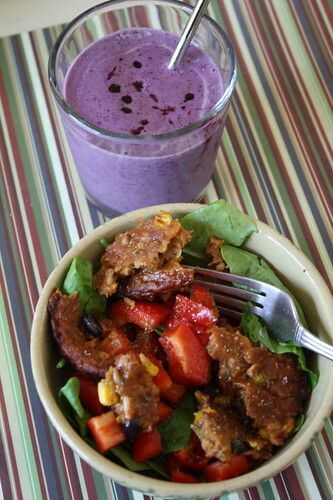 Lunch was spinach with a Morningstar Black Bean burger, red peppers, tomatoes, and olive oil/balsamic dressing and a berry smoothie with Bonne Maman wild blueberry drizzled on top. 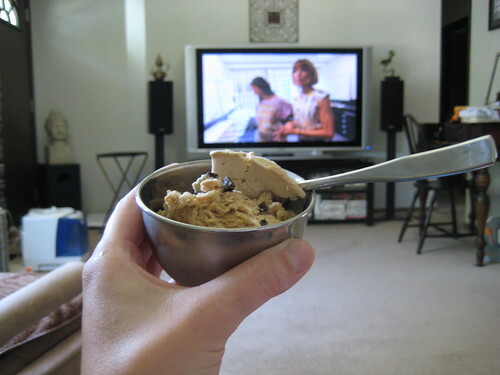 I needed to force myself to relax in the afternoon and still had to watch The September Issue, so I popped it in the DVD player and enjoyed some coffee ice cream too. After the movie was over, I ended my relaxation by organizing files and part of a kitchen cabinet that has been bugging me for a while. 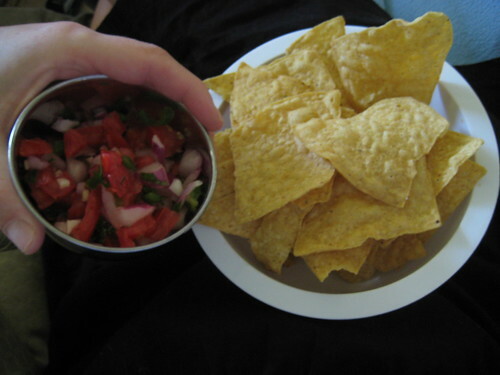 For dinner, we continued our salsa Sunday tradition! 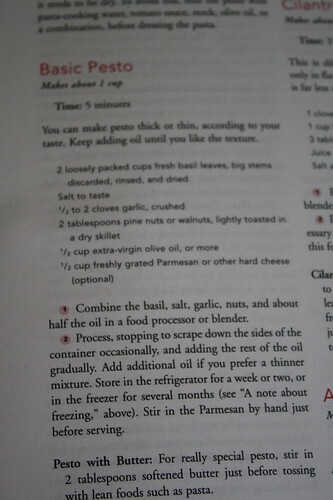 And now I need to go meditate and then get ready for the week by making lunch for tomorrow and reading a bit. I am sad that this three day weekend is over, but I felt like I got to relax and also got what I wanted to done. I wish every weekend was a three day one, especially in the summer. Hope you had a good 4th of July! Last night, I didn’t have time to blog because I literally went home from work, meditated, and then cooked up some tofu on the stove, ate dinner and ran to the mall to meet my mom to see this movie during a free preview. The movie was just ok. My mom enjoyed it and I think most of the older crowd in the audience did. I thought it was predictable and the story wasn’t one that I could relate to (unemployment, foreclosure, divorce), nor do I want to face those subjects when I go to the movies. I like to escape the bad news of the state of our economy, not face it head on. Definitely a rental–I wouldn’t recommend going to it in the theater. 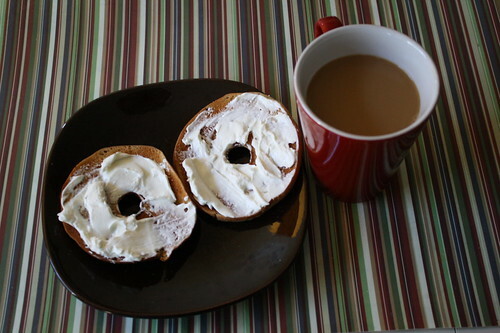 Breakfast–cinnamon raisin bagel thins with cream cheese. I used the last of my coupons to review these courtesy of Thomas and I loved this flavor. 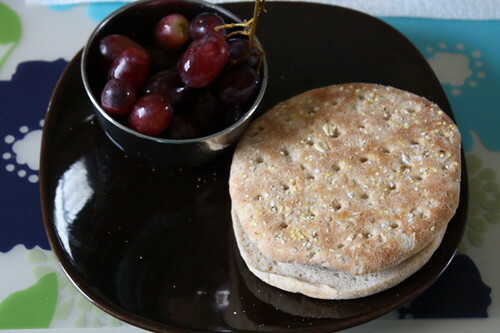 I prefer the thins over huge bagels now. 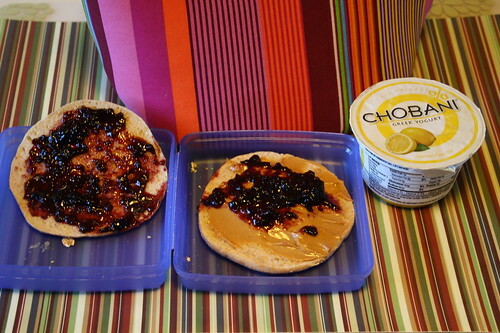 They are great for sandwiches and perfect for breakfast. 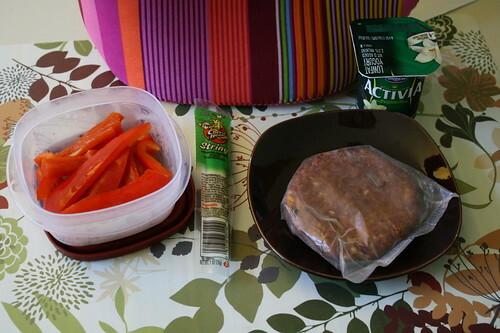 Lunch was a Morningstar black bean burger, red pepper slices, a vanilla activia yogurt and a string cheese. I got my workout in during my lunch break doing our 45 minute yoga session. I spoke to the teacher before class and it turns out that she teaches at my YMCA like I thought she did and then when I mentioned the yoga teachers I like there, she said that one of them is her mom! It all clicked because they look and speak alike! The thing I like best in their similarities is that they both like to put scented towels over our eyes during the rest session at the end. Our scent yesterday was lavender-which was fabulous! 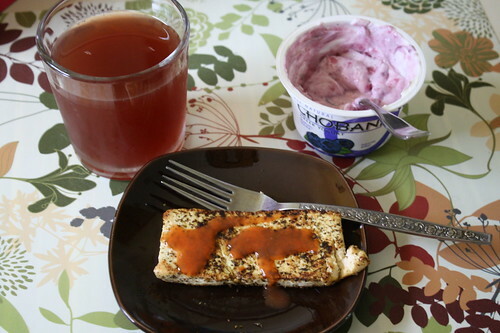 Dinner was tofu with Penzey’s Mural of Flavor again, a blueberry chobani and Pomegranate Green Iced Tea from Trader Joe’s. 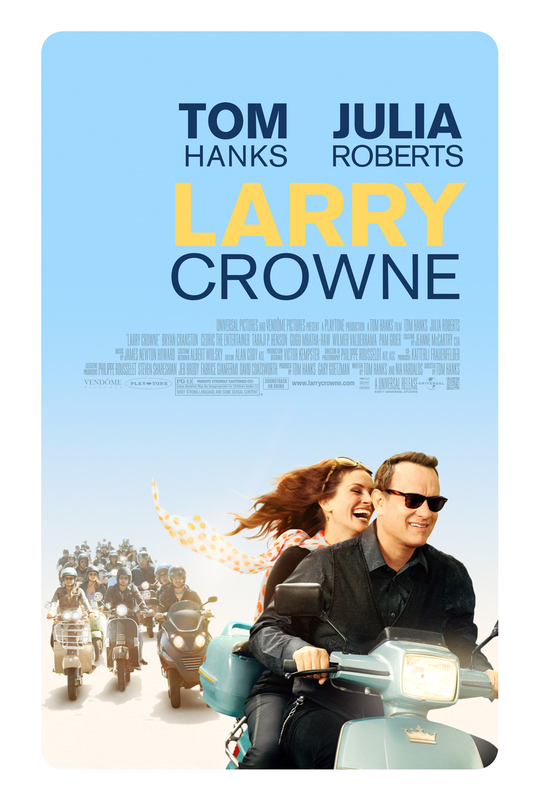 Are you looking forward to seeing any particular movies this summer? I am most interested in seeing The Help. I guess I am behind on what else is coming out, so The Help is all I can think of. I really want to read The Hunger Games and then see that movie, but I don’t know its’ release date. 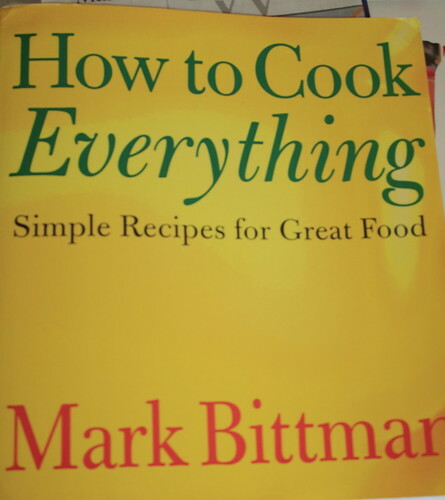 The hubby is reading it now on his kindle and then I will get to it next! I slept in this morning and it was glorious. After a week of feeling really tired as a result of not getting enough sleep, it felt so good to sleep until 8:45. I forced myself to stay in bed that long because I have to stay up until midnight for work. The kitties were all cuddled up next to me and it’s hard to get up with them in our bed. I lounged around a bit this morning, ate breakfast and then finally got myself to the gym. 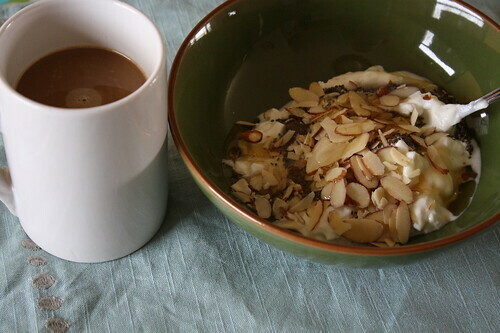 Breakfast was Chobani non-fat plain yogurt with sliced almonds, chia seeds, and honey. At the gym, I lifted a few weights, biked for 20 minutes and then ran for 13 minutes. I pushed myself pretty hard on the treadmill and did some intervals to mimic running outside. I ran into a co-worker there and his talking about the event I have to work tonight kind of put me in a sour mood. I just want it to be over with. 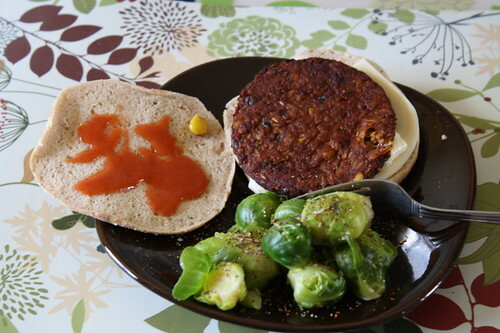 I quickly showered and then made myself a Morningstar black bean burger on an Arnold’s Thin for lunch. I had red grapes on the side. And now I better get ready for work. Have a great Friday afternoon/night! 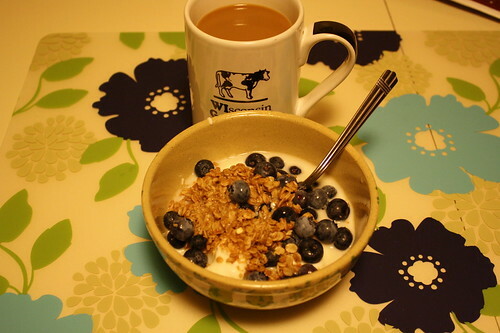 Breakfast was Stonyfield plain yogurt, a bit of almond milk, fresh blueberries and Jessica’s Vanilla Maple natural gluten free granola. I am sad that bag is almost finished, but I’ll move onto one of the other two flavors soon and let you know how it is! Between meetings, I was ready for a snack! I had a mini cinnamon raisin bagel with some cream cheese and a hot chocolate. I have been feeling a little weird taking pictures of my lunches at my work. My co-workers don’t know about my blog and it would seem odd if one of them walked in to see me taking a picture of my food. So, I took a picture at home this morning and will probably do that from now on. Now most of my pictures will have that lovely yellow glow to them. Wish I could magically fix that! I can’t wait for winter to be over with and the sun to be shining when I wake up and when I get home from work. 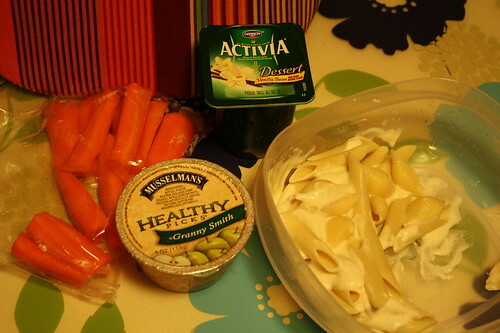 Lunch was pasta with fettuccine sauce, a Musselman’s Granny Smith applesauce that tasted so yummy, a Vanilla Bean Dessert Activia & a lot of carrots. Seriously, I think that applesauce is the best I have ever had in my life. The Activia was just ok. I think I got it for free with double coupons, so I figured it was worth a try. I snacked on some Newman’s Own Organics mini pretzels later in the day and then I left work a little early to head to Bodyblast Boot Camp. 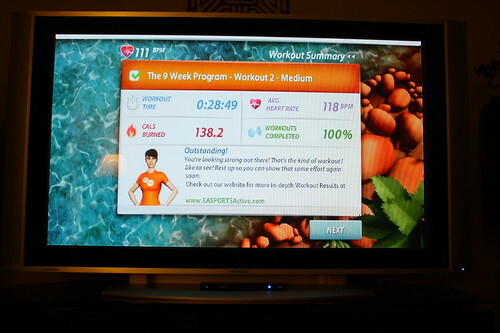 Sadly, I think that was my last boot camp class at the Y. I was really disappointed in the teacher tonight. 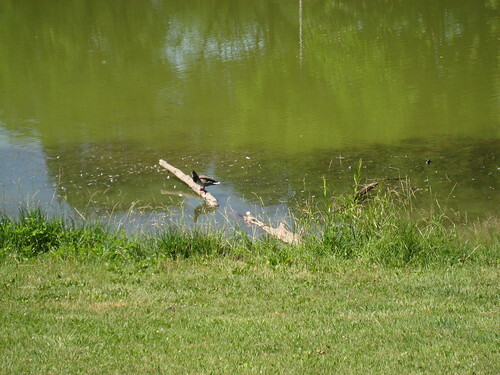 He was a total chatterbox and we all didn’t feel like we got a great workout in. In fact, after class, I went to the weight and cardio machine room to find so many familiar faces from the boot camp class I had just finished. One of the girls was on the elliptical and I chatted to her a bit. She looked over at me and said, “you feel like you need to work out more too because you didn’t get a good workout from class?” I told her yes and we talked about our disappointment. She said she’ll give him another shot, but I said I am not too sure I will. The class is called boot camp for crying out loud! Make us work hard! Sorry, I needed to vent. I think I am better off doing my own thing with weights and cardio on Mondays. After class, my friend Angie and I looked at the class selection for Mondays and nothing else really grabbed my attention. I wish we had a new teacher. The previous one left to go back to school and I attended her class once, but she was excellent. Have you ever tried a boot camp class? 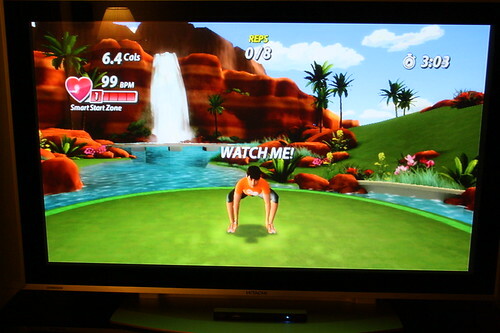 Did you feel like you got a great workout from it? 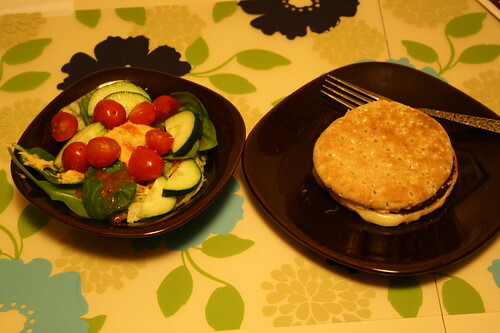 When I got back from the gym, I had a Morningstar Black Bean burger with swiss cheese and a salad. I’m looking forward to going to yoga tomorrow night. I used to declare Tuesdays my rest days, but now I think I will go to yoga when I can. Off to read under a cozy blanket. The Girl Who Kicked the Hornet’s Nest is getting really good and I need to read about 250 more pages and finish before it’s due back to the library in a week! The roads were nice and quiet driving into downtown Milwaukee this morning. For those of you who were off, hope you had a nice day. Maybe you even volunteered your time in honor of MLK’s philosophies. A lot of people seemed to be off for MLK day. We consider MLK day a minor holiday at my work and I earn holiday hours, but everyone seems to go in. 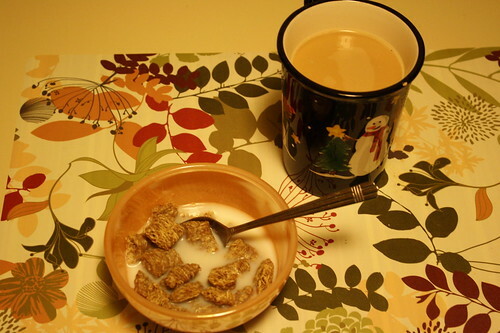 I started my sleepy Monday with Kashi Autumn Wheat cereal and coffee. 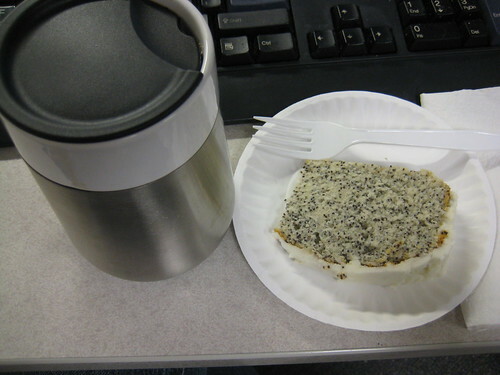 Snack at work was a handful of raw almonds and another cup of coffee. I was tired this morning because I didn’t get to bed on time last night. Blame sleeping in on the weekend for making my schedule wacky. I’ll get back on schedule tonight and read before falling asleep around 9:45. 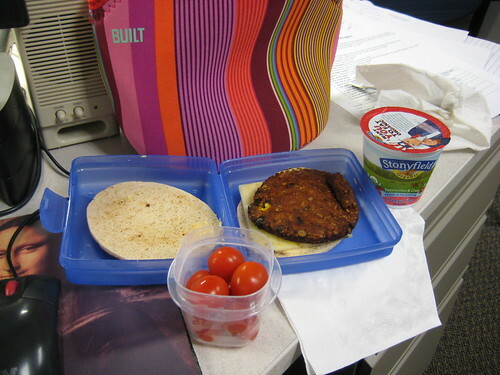 Lunch was a Morningstar black bean burger, a Stonyfield Strawberries and Cream yogurt (yum, loved this flavor) and some grape tomatoes. I still had a craving for something sweet, so I had a sugar free caramel pudding. 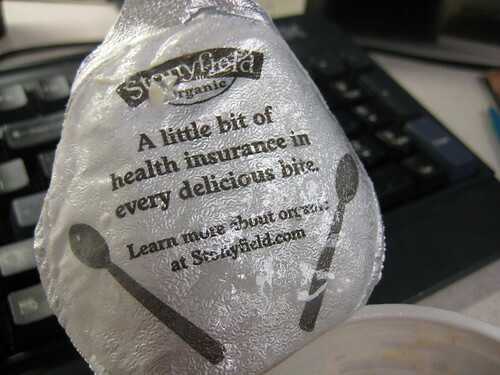 Loved this quote on the inside of my Stonyfield lid. 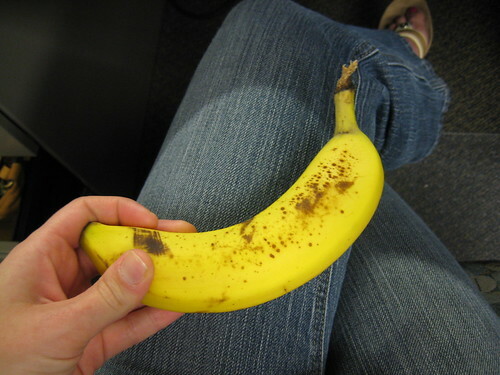 Reminds me of the portion distortion class I attended in the fall at the YMCA. I wish I had been off today because on my way home, my little Honda and I had to battle the snow storm. I went really slow and took the freeway home because it was much clearer than our sloppy side roads. My car just doesn’t like the slushy roads. Once home, I shoveled so my husband could pull in the driveway and then he finished the rest when he got home. I was hungry for dinner and it had to be quick, so there went my plans for quinoa with tofu, chickpeas, tomatoes, etc. 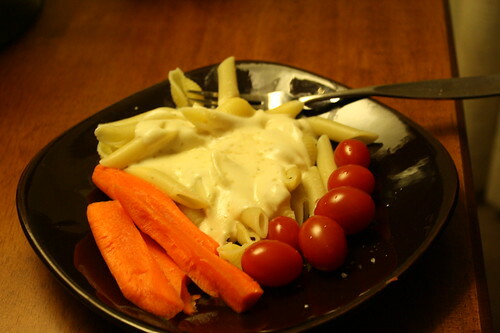 I made some fettuccine alfredo and had carrots and grape tomatoes with it. 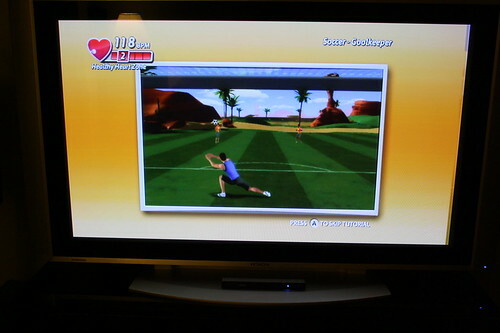 I rested a bit, did some dishes and then did an indoor workout with EA Sports Active 2 on the Wii. There was no way I was heading back out to the YMCA on a night like tonight. Time to read some blogs, the Larsson book (it’s getting really good now) and get to bed early tonight.